Ibo et Non Redibo: Can University Students be Holy? The most obvious challenge that students face is the lack of time and energy to dedicate themselves to events that are organized either by the chaplaincy centre or by the local parish. Full-time students have at least 15 hours of class time if they are in arts, and at least 25 hours if they are in the sciences or engineering. We also need to add on the time spent on studying. Finally, we need to take into account that many students have part-time jobs on the side to pay for their studies. The remaining free time that they have is either dedicated to commuting or spending some time with family and friends. How much free time is left for Church events? By this account, not much. After the time problem comes the problem of peer pressure. I’ve talked to a number of students that are ridiculed by their fellow students for the faith that they profess; unfortunately, professors also join in the Catholic-bashing party. This is especially felt if one lives in the dormitories. First year students are easily influenced by such a surrounding because of the high exposure; furthermore, they didn’t necessarily choose their room-mates. Many end up caving to peer pressure. Why go to an evening bible study when many of your friends want to play video games or go see a movie? Do you want to be called the religious fanatic of the group? On top of this come the peer pressure regarding drug use and sexual advances. The Catholic student who is immersed in this stormy experience of university is necessarily faced with the existential question posted by Jesus: “What are you looking for?” (Jn 1:38) Indeed, what are you looking for in life? Why are you studying what you are studying? To what end? It helps to put things into perspective. The gift of knowledge is precious; it is, after all, a gift of the Holy Spirit. The choice of studies should be therefore enlightened by the personal vocation that we have been given. As such, our studies ought to firmly establish us in the mission that we have received from God. That is admittedly a tall order, because students are so overwhelmed by their studies and the stress of it all that they simply don’t take the time for prayerful reflection. Each one of us has a gift and a vocation to fulfil: one as a nurse, another as an engineer, and so on. Our studies are to help us fulfil the mission that we have received from God. If we understand our studies this way, then our faith life ought to be intimately integrated in our studies, since it is from our faith that we will draw strength and courage to take on the challenges of studies. If it comes to prioritizing, we should give faith events a serious thought. If there is an hour or two free, let us nourish the spirit as well. When it comes to prayer and discerning God’s will on a daily basis, I will offer a couple of suggestions that are really not that taxing when it comes to time and energy. The first thing that can be done – and this does not even take a whole minute – is to offer one’s day to God right after waking. It is called the “Morning Offering” prayer. It is a beautiful way of offering all aspects of our day to God; the joys, the sorrows, the blessings, the failings, we offer up all of these. This gives us a sense of walking with God for the rest of the day and it will be enough to put our frame of mind in a religious “mode”. Another simple exercise that can be easily prayed anywhere, be it when we walk to and from school, when we’re on the bus or in the car, is the millennia old “Jesus prayer”: “Jesus, Son of the Living God, have mercy on me, a sinner” (based on Mk 10:47). This short prayer has been used since the earliest of days of the Church. It is said to the rhythm of our breath, and so every breath that we take becomes united to prayer – we begin to “pray without ceasing” (1 Thess 5:17). The Rosary can also be prayed anywhere and quite easily as one travels by foot or by bus. Finally, there is the short ten-minute Examen Prayer that can be done at night before going to sleep. It is a short and effective method to perceive God’s activity in our day and examine how we have responded to this. It is a powerful tool to grow in holiness, since we continue to build on the previous day’s challenges, and so forth: at the end of each day, a commitment is made for the next day. As such, the Examen prayer is a dynamic prayer, focused on continual growth in holiness. All of these are ways to include prayer in our day so that it may indeed be hallowed. Including these prayers will bring us closer to God and will help us contextualize our studies – we study for no other reason than to give God glory. I must say one final word about the Christian community. Praying as I have mentioned above is key and should be the foundation for all other faith activities. 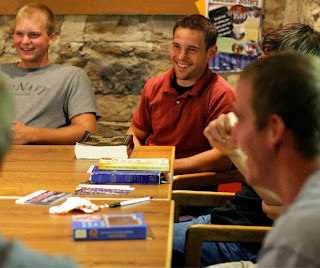 Participating in a faith community on campus on a regular basis is, without exaggeration, a must. Our Christian life is a communal life. It is in community that we partake of the Eucharist; it is in community that we strengthen each other through learning about the faith, praying together, and growing in friendship. Make an effort to involve yourself in some way in the on-campus community of faith. It will most definitely enrich your time at university, and you will make life-long friendships.